I'm just back from the most awesome Literacy for Life conference in Saskatoon, Saskatchewan where close to 5000 kids were fortunate enough to meet authors, illustrators and science journalists over three days at the University of Saskatchewan. The program was designed for grades 3-12, and featured a fourth day to inspire the business and political community to get on board with literature and literacy . I was lucky enough to meet a long-time hero, author and radio and TV personality Bob McDonald who hosts Quirks & Quarks, one of my all time favourite science shows. I loved seeing the fabulous Northern Cree, meeting Jamie Bastedo, George Littlechild and Joe Schwarcz, and catching up with old friends Helaine Becker, and Diane Swanson. 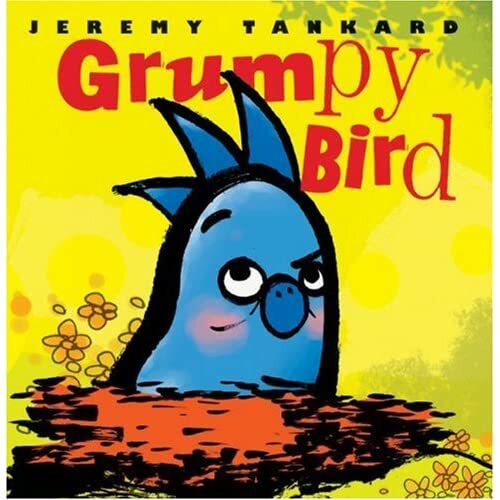 I also met Jeremy Tankard, the talented young illustrator of Grumpy Bird, which I adored. I am delighted to report that his new book is just as engaging. Kids will love Me Hungry, and so will adults. 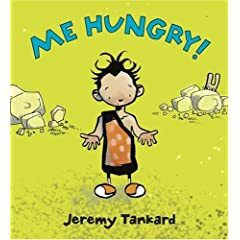 When a stone age boy announces, "Me hungry," a "Me busy," reply from parents sends him in search of food. Comical encoun ters with a crafty rabbit, a too-prickly porcupine, and a saber-toothed tiger are sure to make even the most grumpy readers smile. The simple text adds to the humour implicit in the what has rapidly become a signature illustrative style. 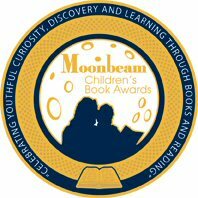 Tankard is clearly a creator to be watched, and you might even find him featured in Betsy Bird's "Hot Men of Children's Literature Column" if (I'm hoping when) she reinstates it.